SO FRUSTRATING!!!! 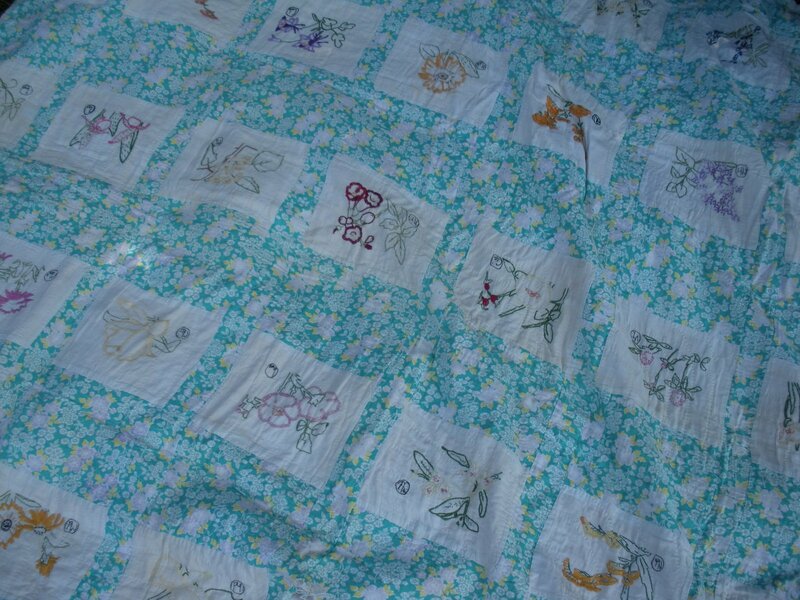 I adore vintage quilts. I enjoy studying the stitches, examining the fabric designs and motifs and colors, noticing little discrepancies or flaws (were they intentional, or true accidents? 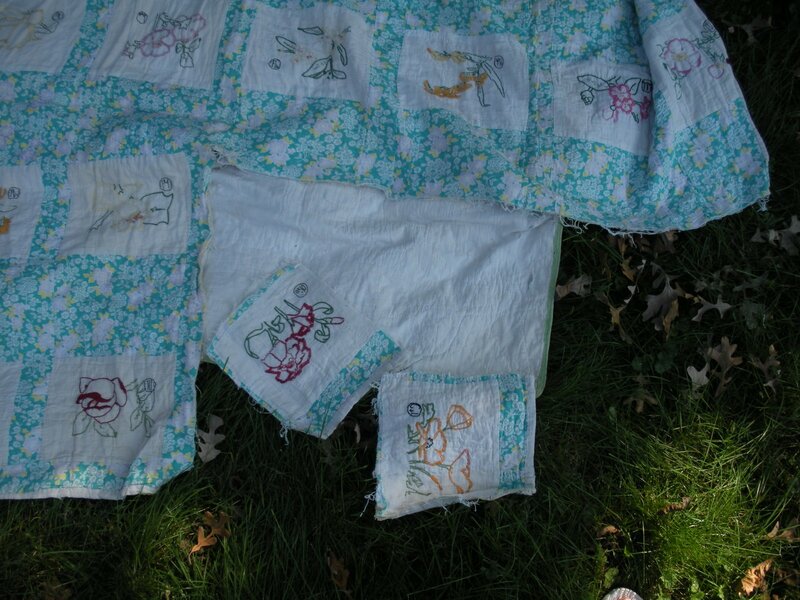 )…wondering about the maker…did she quilt this for her child’s bed…did her little girl have a dress made out of that fabric…how did she decide to use this block patttern? It’s an unsolvable mystery, but it gives me a sense of connection to those quilters from the past, a warm, fuzzy feeling. 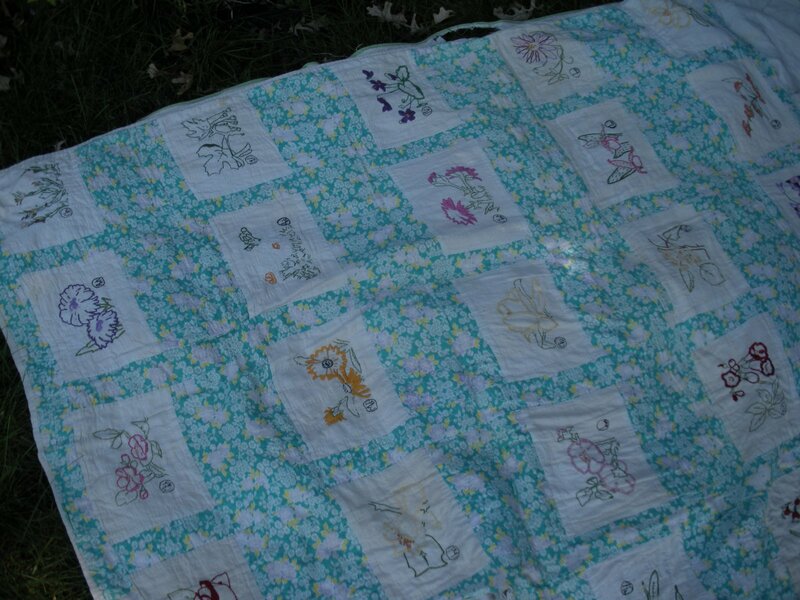 This is one of a dozen or so quilts that were gifted to me this summer following the Floods of 2008 here in Iowa. They were saved from a flooded home, and the owner was going to toss them, but most people that know me, know I’m a sucker for rescuing near hopeless cases…so they were given to me. Some of them really don’t have much to salvage, not because of flood damage, but because of being loved to near death and used within a thread of their lives…you’ll see what I mean as I post the rest of them in the coming weeks. But this one, is great! 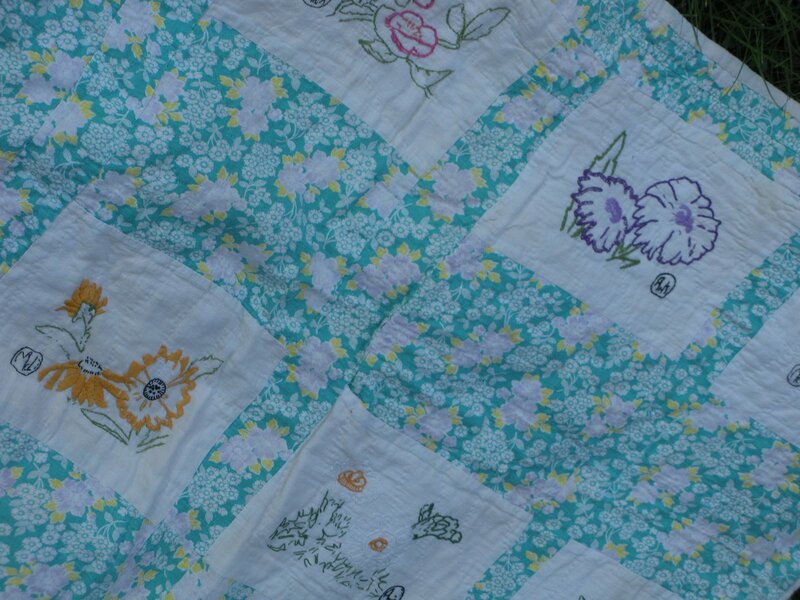 It features hand embroidered blocks of the State Flowers from each state, arranged in rows with a simple setting of wide green and yellow flowered cotton sashing. Apparently, someone decided somewhere along the line that they wanted that particular State Flower block, so they just lopped off a corner of the quilt. Actually, two corners. I’m not kidding…chopped it off like they were slicing a piece of bread for dinner. Monday Mile Marker: Last week started out with lots of motivation and ambition on the exercise front…and trailed off slightly as the week went on. Total miles of exercise activity: 12.25. I’ve seen quilts like this. It makes you want to cringe! 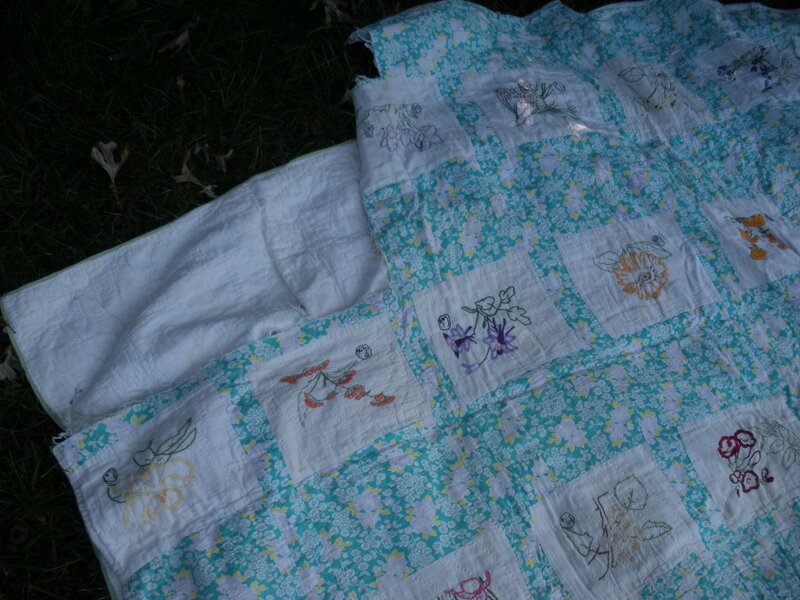 i’m with you…i love vintage quilts and i always wonder about them too. it’s hard to believe that someone would do something like this. i hope you can find some way to use or repair this. doris, you asked about the raw edge applique. i was worried about all those things too. i used fusible web to attach the pieces, no stabilizer. didn’t worry about cutting on the bias. the piece was washed and there was very little fraying. i stitched about 1/8th inch from the edge or closer. the only thing i didn’t like is where there is fusible, the area doesn’t pucker nicely. it stays pretty flat and stiff. i think i’ll try and trim and use less fusible on the next ones. hope this helps. Ugh. Isn’t that just ridiculous? People have no respect for the amount of work a project like that takes! It is a shame about the damage but if the cut out pieces are opposite each other, maybe you could finish the edges as if it was for a 4-poster bed.